ARY WAS A Jewess. She had grown to womanhood in Nazareth, a city of Galilee. And she was expecting soon to marry a good man named Joseph. Both Mary and Joseph were descendants of King David, but they were poor people. Joseph was a carpenter, and he worked with his tools to make a living for himself and to prepare a home for his bride. For he said, "You are highly favored and blessed among women, for the Lord is with you." And he said, "Although they are old people, nothing is too hard for God to do." Then Mary knew that God could give her this wonderful child which the angel had promised, and she said, "Be it unto me according to thy word." The two women spent many happy days together, then Mary hurried back to her own home in Nazareth. There God's angel spoke to Joseph, the carpenter, in a dream, and told him about the wonderful secret of Jesus' birth. And Joseph was glad, for he had been longing for the time to come when the promised Savior should be born. 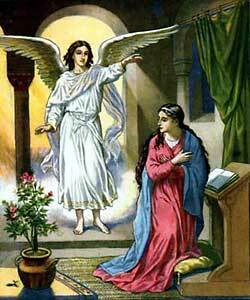 He took Mary into his home and they waited for the angel's promise to come true.